Faithful readers of this space will recall from several weeks ago our previous article on AmpliFi, one of the better so-called “mesh” home Wi-Fi systems available. Today we take a closer look at some of AmpliFi’s more celebrated competitors and Home Wi-Fi systems in general. These highly sought-after home tech items are among Amazon’s most popular consumer electronic devices despite their pricey cost. So just in time for the holiday season, we’ll give you the skinny on these trendy products. There are three underlying truths in today’s tech: faster devices, faster communication speeds and better wireless capability. Nobody wants connectivity for devices using unsightly wires that snarl or come unplugged. Nobody wants a device that ties the user down to a desk. And now with the recent Wi-Fi (IEEE 802.11ac) standard integrated into these mesh systems, there’s no need to plug in an Ethernet cable to get gig speeds. What Makes Mesh Wi-Fi Systems Different? 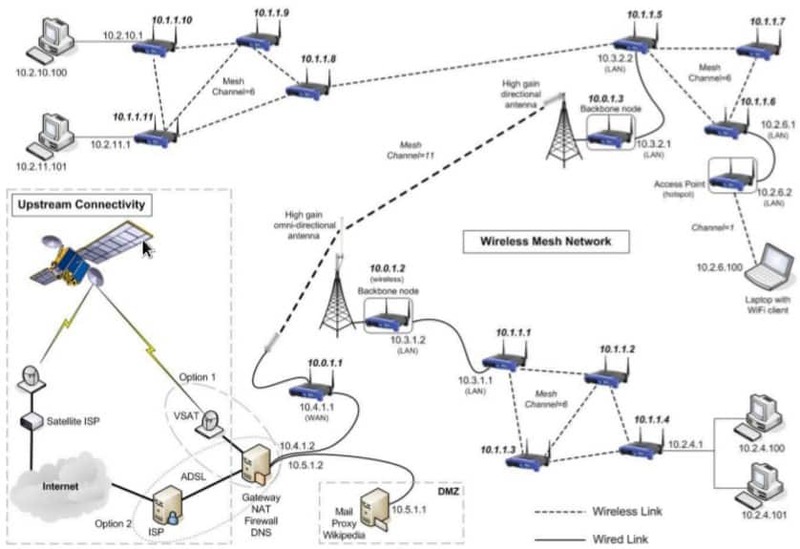 The diagram shown below incorporates an enterprise wireless mesh system (here incorporated with a VSAT link) as part of a larger overall network. While this application envisions a scale much larger than the typical home Wi-Fi WLAN, functions are still essentially the same. With only one Wi-Fi hotspot serving a large home, dead spots will almost certainly be present. It’s a plain fact that transmission speeds slow the further a device is from a Wi-Fi hotspot or access point. This is an untenable situation given the proliferation of today’s electronic devices in the home which demand plenty of bandwidth. Not just SmartPhones but Smart UHD TVs, digital media players and virtual personal assistants like Amazon Echo — they all tend to be located in locations where they can’t connect with the home hotspot. And of course they all too frequently compete simultaneously for limited bandwidth made even more limited by distance or impervious barriers like brick walls. Think about Junior playing his X-Box or PlayStation in his bedroom, Mom watching a Netflix movie on a UHD TV in the den and Dad’s laptop in the study constantly downloading weird apps without his knowledge, all at the same time, and one readily see the inadequacy of just one access point. Enter the mesh home Wi-Fi system. By using a series of strategically placed “mesh points,” a home Wi-Fi mesh system can provide a strong Wi-Fi signal to every part of one’s home. The topology of a mesh network means that each node, or mesh point, cooperates in relaying data for the entire network. Home Wi-Fi mesh systems use routing techniques to hop from node to node until reaching the destination device, which automatically selects the mesh point with the strongest signal. No worries about manually searching for the most robust signal or using different Service Set Identifiers (SSIDs) between various home hotspots. Note that the mesh Wi-Fi network is an example of a wireless ad hoc network (WANET) in which each mesh point contributes to routing by forwarding data to and from other mesh points. The mesh Wi-Fi network can also be described as a peer-to-peer (P2P) communications model where all nodes have equal capabilities. Too, Mesh networks have “self-healing” capability — the ability for a node to select the best mesh point rather than a static connection to a single hotspot — which also provides network redundancy in case one node becomes inactive. It’s mea culpa time from your intrepid author. In the previous article on AmpliFi, jargon such as “bridge extenders” and “mesh points” were bandied about as if they were interchangeable terms. They are not. 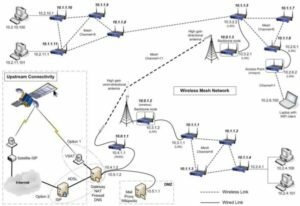 Wireless distribution systems (WDSs), wireless repeating, wireless bridging and Wi-Fi mesh networking are similar technologies but each has key differences from the others. Wireless Bridges — installed on conventional Wi-Fi networks to provide wired connectivity to network devices using the bridge’s Ethernet ports. They are sometimes referred to as extenders for wireless coverage because they typically have better antennae than most computing devices. Wireless Repeaters — offer both wireless connectivity to a Wi-Fi network as well as allowing devices to connect to the repeater, thus serving the role of a conventional hotspot. Repeaters are located on the edge of a Wi-Fi network’s range to extend coverage. There are even wired access points that serve as both wireless bridges and wireless repeaters. WDS – describes a feature found on various conventional wireless hotspots that support wireless bridging and/or repeating. A capability known as relay base station mode, found on some WDS hotspots, allows the access point to act as both repeater as well as communicate wirelessly with other wireless repeaters. Of the three, this is the most similar to mesh networking. Google claims a single node of its Wi-Fi system will cover up to 1,500 ft (ah, but at what speed?) with a set of three covering up to 4,500 ft². The open-ended architecture of the system allows the addition of additional mesh points. It uses a companion app to prioritize devices on your home WLAN, which means Mom can slow down Junior’s Fallout 4 on his XBox or his Grand Theft Auto 5 on his PS 4. Tech specs for the Google Wi-Fi system include two Gbps Ethernet port per point, which both act as LAN ports on additional Wi-Fi points. It includes simultaneous dual-band Wi-Fi (i.e., 2.4 GHz and 5 GHz), thus supporting legacy IEEE 802.11 standards and devices. Setup requires a Google account, either an Android (4.0+) or iOS device (iOS 8+), a Google Wi-Fi app, a broadband Internet connection and a modem. As the WSJ vid above mentions, a big selling point for the Eero Wi-Fi mesh networking system is its ease of set-up. All that additional eeros need is the juice from an electrical outlet but should Ethernet wiring be available, eeros can be hardwired as well. The companion app even works as a Wi-Fi analyzer to help you find the best location for the mesh point. Note that the advertised range of the Eero is considerably less than the Google product at 1,000 ft² per eero. It has similar specs to the Google Wi-Fi system, including low-power Bluetooth capability. One notable difference between Eero and other two: it only has one Ethernet port — a case of sacrificing functionality for simplicity. News flash: just a few days ago (mid-November 2016) Eero announced a massive software update called TrueMesh, increasing transmission speed up to 2x faster between individual eeros. Expect 40% improvement for your Eero system, according to slashgear.com. And that’s not all — the update includes the enablement of Alexa skills, allowing compatibility with Echo, Echo Dot and Amazon Tap. Coming are improvements in the mobile app, which means you’ll then be able to frustrate Junior on his games console as well as monitoring analytics such as signal strength and data usage for each eero. This formidable blowback from Eero shows that they aren’t giving Google Wi-Fi a free pass in the marketplace. Last but certainly not least is Luma, which like the other two has a visually appealing, futuristic design. It too features ease of installation and configuration. It’s perhaps the best of all three with regard to in loco parentis monitoring and security. PC Magazine notes that it has “good close-proximity throughput in testing.” But… it has a limited number of Ethernet ports, which is problematic for those who use smart home hubs and home entertainment systems. There’s also no dedicated band control — remember Junior and his games console? — and no advanced management settings. PC Magazine considers its range performance only “middling.” So is the price tag and coverage range when compared to Google Wi-Fi (relatively low) and Eero (relatively high). Luma architecture is not open-ended but allows up to 10 nodes on a single network, which should be plenty for almost any home. Again, similar tech specs to the other two products, with the 802.11 ac standard, quad-core processor and dual Wi-Fi bands. Just like Eero and Google, it requires a mobile device for management controls … as if everyone really wants to have a SmartPhone. Beating Eero to the punch, it already enables Alexa skills. For those expecting Apple to offer a similar product, expect elsewise. Their routers, including AirPort Extreme, AirPort Express and AirPort Time Capsule (a router with network-attached storage), haven’t seen upgrades since 2013. With these products contributing well below 5% to the company’s revenues, it seems likely that Apple will instead look to cloud services instead of the increasingly competitive home Wi-Fi mesh networking market.